After sharing a prophetic parable regarding the workers of the Gospel from the work started by Israel to the finishing of the work when the 11th hour workers finished at end of the world, (See Matthew 20:1-7) Jesus illustrated something the apostate SDA church refuses to admit today. When ending the parable in which He describes the duty of each church throughout time, He speaks on how earlier workers were upset that workers hired at the end of the day received the same pay as those that worked during the heat of the day. It literally says in Matthew 20:12, "These last have wrought but one hour, and thou hast made them equal unto us, which have borne the burden and heat of the day." This is how the Seventh Day Adventist leaders react to the blessings placed upon the "remnant of her seed" to this day. They complain, "we are the remnant, we deserve the penny because we worked all day long," when in fact they stopped doing the work to the point a "remnant of her seed" was hired to finish it. It's no different than the pride the Pharisees had when they saw their work slipping through their fingers after Jesus and then the Apostles started to draw people into the truth they were no longer able or even willing to share. Those that started the work in the 9th hour (SDA church) became prideful in their position; especially after failing in their duty to the point those in the 11th hour (SDR church) were hired to finish the work. So, like the Pharisees of old, the SDA leaders are prideful and declare they are the remnant and deserve the "penny." And so, those that are last fill the places of those that were first. 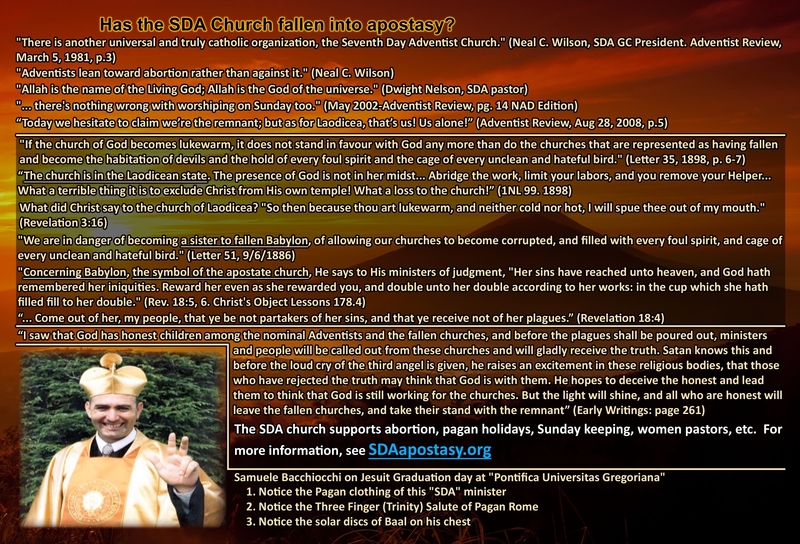 For much more detail on this prophesied fact, click here for the biblical, historical and Spirit of Prophecy facts on why the SDA church can't possibly be the Remnant church. Greetings, and welcome to SDAapostasy.org Many in the Seventh-day Adventist (SDA) church are being taught to take Sister White out of context so as to say you should never leave the General Conference (GC) churches. It's true, some were calling the SDA church "Babylon" back in her day when the 9th hour movement was upon us. Of course at that time it was prophetically wrong to preach such a thing, and Sister White speaks on this being the case in her writings. However, the GC preachers of today are openly twisting her writings to make you believe she is talking of today's church. That of course is not the truth as both Scripture and Spirit of Prophecy (SOP) will bear out. 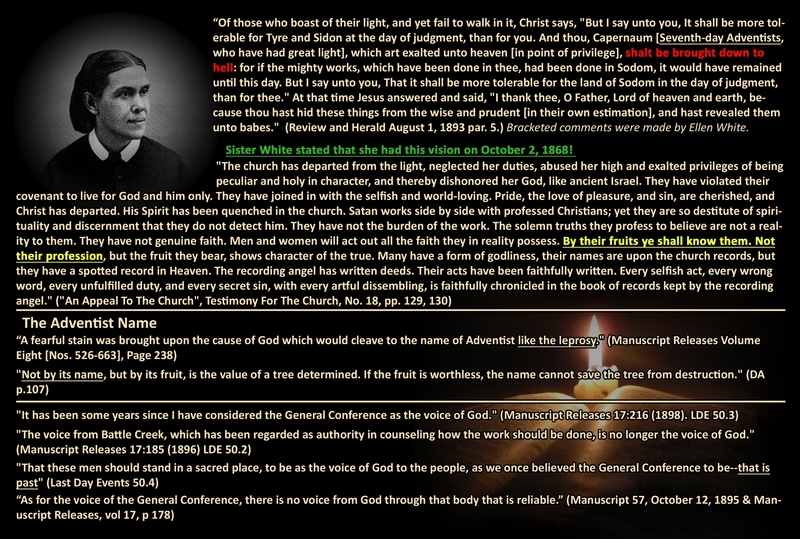 On this site it is our desire to share with you the quotes they share so as to place them back in context, as well as share many quotes from Sister White along with Scriptural facts they seem to avoid from the pulpits of the SDA churches. Our prayer is that you view this site in the Spirit in which it was given. Out of love and deep respect for the remnant of her seed still within the SDA church. My prayer is that the verifiable truth contained in these pages leads you to a strong and fervant desire to look into the Word of God as well as the words of His prophet to see for yourselves the present truth for our day. Ezekiel 33:11, "Say unto them, As I live, saith the Lord GOD, I have no pleasure in the death of the wicked; but that the wicked turn from his way and live: turn ye, turn ye from your evil ways; for why will ye die, O house of Israel?" Ezekiel 33:20, "Yet ye say, The way of the Lord is not equal. O ye house of Israel, I will judge you every one after his ways." Why are SDA Pastors MISSING ALL MAJOR Prophesied Current Events?